Declarative knowledge has a key role in health-care domain, which is hidden in multiple clinical-related knowledge resources. For acquiring and constructing the declarative structured knowledge from unstructured knowledge resources, UDeKAM methodology was proposed that lacks the intelligent human dialoguing mechanism for validating and filtering the important concept relations. 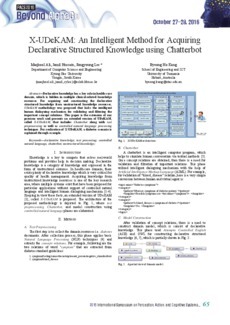 This paper is the extension of our previous work and presents an extended version of UDeKAM, called X-UDeKAM, that includes Chatterbot along with text preprocessing as well as controlled natural language processing techniques. For realization of X-UDeKAM, a diabetes scenario is explained through example.